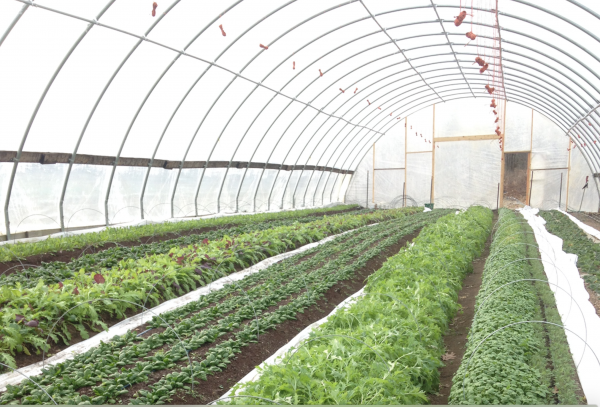 Greens growing in winter in a Tait Farm hoophouse. As our central Pennsylvania winter slogs onward into the home stretch, have you ever wondered what vegetable/fruit farmers do during the cold months? While things slow down, farmers do not exactly sit around and watch Netflix. They have plenty of chores, and even grow and harvest things. Along with harvesting, washing, and packing this produce, Hopey said they need to do other work to make sure the greens are growing. Along with the usual stuff such as watering, they also need to do daily ventilation and temperature monitoring of their hoop houses and low tunnels. Along with the fresh-grown greens and such, Tait Farm also harvests a large amount of root crops such as carrots, beets, onions, garlic, celeriac, and radishes. These are then stored in a walk-in cooler and washed and packed each week for various markets. This way, Hopey said, they can offer root vegetables until about May, when spring root crops come in. Thanks to this work, winter CSA members get quite a variety, Hopey said. “They get potatoes, onions, garlic, kale, spinach or salad greens, carrots, beets, radishes, winter squash, leeks, cabbage, and herbs such as parsley, thyme, rosemary, or cilantro,” he said. Along with growing vegetables and harvesting, there are plenty of other farm chores, Hopey said. This includes maintenance of things such as tractors, equipment, irrigation systems, and other growing supplies. They also do early prep for spring by spreading compost on the fields. Then there is the business and crop planning. Hopey said they figure out crop rotations and amounts of each crop to grow based on previous sales records. They also adjust the timing on crop production to better meet seasonal market demand. Then, Tait Farm staff tests the soil to determine soil fertility for next season. They also have to remain vigilant for snow and ice. Winter accumulations of precipitation can damage hoophouses and prevent crop access to sun and warmth.